Playaway, The All-In-One Audiobook | OhGizmo! Been out for a bit, but I just stumbled on this and I think it’s great. 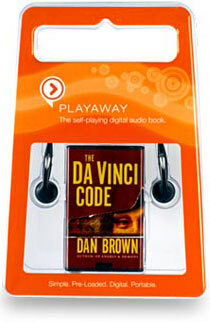 Think of it as an “Audiobook for Dummies”: the Playaway is an all-in-one audiobook solution. You don’t have to download anything, buy a CD, a casette or even own a music player. Just pick up a title of your choice, and you’re good to go. It’s powered through a single AAA battery, and aside from volume control, you can adjust the reading speed, pause, place bookmarks and skip chapters. It’s about as big as half a deck of cards, and the included AAA battery is even replaceable, should you purchase an unabridged King James or something. Oh, and the headphones are included as well, and they can be converted to lanyard types. Prices start at $35, which isn’t all that bad considering the relative convenience.